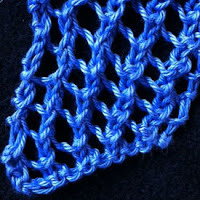 This is another stitch that is super easy and gives a nice, lacy effect great for a summer scarf or shawl. Only two rows, this stitch is easy to remember too. As you can see from the picture, this stitch creates an angled fabric - something you may want to consider. Also, the edges are a bit sloppy, so you may also want to add some extra stitches for a border, depending on what you are knitting. Wonderful stitch and I look forward to using it! I'm pretty new to knitting, having taught myself only a month or so ago but I'm already in love with your site. I was just wondering, is there a way to create this stitch without it angling, or in the very least, how do I go about angling it in the opposite direction? Thank you so much for putting so much work into this site. It's just the best. Hi Nell, thanks for visiting my blog! Odd number of stitches, every row is the same - Knit 2 together, YO to the last stitch, and Knit 1. Make sure you do a YO before knitting the last stitch, or you will have one less stitch! To make this slant in the opposite direction, change the knit 2 together to a slip, slip, knit. Most directions tell you to slip the two stitches knitwise, but I do the first one knitwise, and the second purlwise. I think it makes it a little neater, but it doesn't matter. Either way is correct.